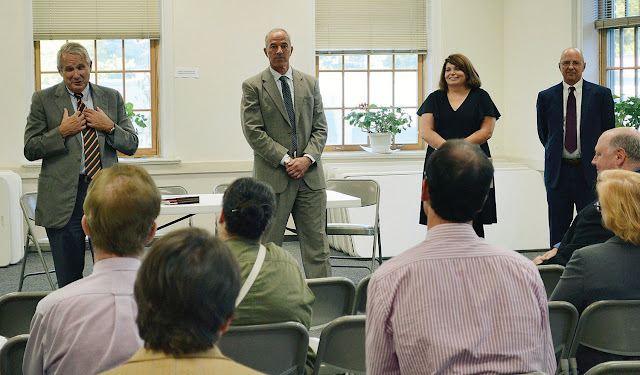 Chief Justice Reiber and Gary Franklin have conducted two listening tours since late September, the first in Addison County and the second in Bennington County. County Bar Presidents and Presiding Judges have joined the tour at each stop. 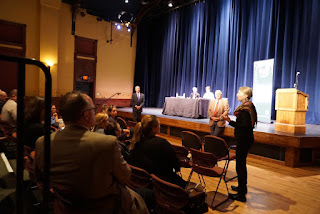 The idea was to reach out to the public and hear any thoughts, critique, ideas or stories about how the judiciary and Vermont lawyers are serving the general public, including sharing what resources may be available to help meet legal needs. VBA President Gary Franklin was particularly struck by the attendance at the meetings by so many stakeholders including lawyers, legislators, non-profit service agencies and court staff, making these tours an ideal place to bring all the participants and stakeholders together. Says President Franklin: “Our mission is to serve the public and the profession. The listening tour is proving to be a valuable tool to gain insight into how the practice of law and the realities or limitations of the courts affect each community in Vermont.” Franklin sees this tour as a way to make inroads into the ‘access to justice gap’ where there is known to be a large segment of the population, those just beyond the reach of free legal services in terms of income, who are not being served, while simultaneously there is a population of lawyers in Vermont who wish to connect with those needing services. Hearing stories from the public may help to close the gap where the communities can give insight into where legal assistance is needed and why it is not being sought. One common theme being addressed at the listening tours is a recognition of how the opiate crisis is impacting the court system and court resources. There was also much discussion about legal clinics, the delivery of basic public education on the rule of law and specific areas of law and mediation, among other things. Chief Justice Reiber spoke about how the bench and bar can, and should be, leaders in civil discourse and elevating the civil tone surrounding meaningful but divisive legal issues. While each tour has been merely 1 hour, the range, level and import of issues discussed has been remarkable. The counties are being visited in roughly alphabetical order, so stay tuned for the next tour stop announcement. The VBA will issue a press release regarding each event as they are scheduled, so if you are interested in attending the listening tour in your county, please feel free to contact the VBA, your County Bar President or local courthouse for more information as the Chief and VBA President travel throughout the State. We want to hear from you and we are listening! The top photo is from an article in the Bennington Banner from October 11, 2018. The photo credits David Lachance and shows from left to right: Chief Justice Reiber, VBA President Franklin, Bennington County Bar President Sarah Wilson and Bennington Unit Presiding Judge William Cohen speaking to the attendees. Chief Justice Reiber, VBA President Franklin and VBA Executive Director Teri Corsones also participated in a radio show, Bennington Today, before the tour. The final photo is from the Addison tour. I look forward to this and appreciate you offering this. I am deeply concerned as a taxpayer and citizen. I have been personally impacted by family circumstances that have awakened me to the current broken judicial system. Yes , I think its broken! I have a family member that myself and others have followed his case closely. I would be the first person to see the truth and justiced followed. If someone is guilty then they are guilty and pay the price deemed. What is disturbing is to many prosecutors looking to win instead of serve justice and truth. I never gave it a thought as an individual that has never been in the court system. It has made me so aware of the disparities and political agendas within the legal system. My story is long and complex but worth hearing . To drive change perhaps , awareness and maybe for someone like my nephew, maybe get justice.. He has been ignored , ridiculed , lied to about his rights as a paying client from his lawyer We would have never pitched in and hired a lawyer if my nephew was guilty we believe truth. . This is a paid lawyer. He has refused to to call any witnesses or question people involved. Refused to do things a paid Lawyer ethically should do.This is a paid Lawyer in Vermont. I realize there are political motivations but this is someones life . This is the just first step in understanding what is going on. Anyone that will hear this and reach out to restore some sense of justice. Vermont our judicial system is broken. I have seen in my area alone, people drive drunk and on opiates death resulting freed on bail and cleared. Lamoille County released these addicts back into the community. I witness small cases get large sentences and large cases get small sentences . Does the Bar association really serve as a standard to preserve ethical lawyer practices?????? Please then someone reach out and help me understand as a citizen representing the working class citizen relying on our Judicial system to function with integrity. Side note the lawyer my family hired wants to be a judge.